Approximately 10,000 more folks are diagnosed with a brain tumour every single year here in Canada. Brain tumours are the leading cause of solid cancer death in children under the age of 20 and are the third leading cause of solid cancer death in young adults as well between the ages of 20-39. Fact. We don’t like to think about this stuff but it’s all true and real life for too many people. Lets bring brain cancer to the forefront!! We need funding. -Because brain tumours are located in the control centre for thought, emotion, and movement, they can dramatically affect an individual’s physical and cognitive abilities and quality of life. -There are over 120 different types of brain tumours, making effective treatment very complicated. -Brain tumours in children are different from those in adults and are often treated differently. Although as many as 60% of children with brain tumours will survive, they are often left with long-term side effects. -Metastatic brain tumours are the leading cause of solid cancer death in children under the age of 20, now surpassing acute lymphoblastic leukemia. They are the third leading cause of solid cancer death in young adults ages 20-39. -The most common type of primary brain tumour, glioblastoma multiforme, is also the most malignant. Average survival, even with aggressive treatment, is less than one year. -Primary brain tumours (originating in the brain) occur in 8 out of 100,000 people.This number rises to approximately 32 per 100,000 when metastatic tumours (cancer originating in other areas of the body that has spread to the brain) are included. -Enhancing the quality of life for people with brain tumours requires access to quality special care, clinical trials, follow-up care and rehabilitative services. -Currently, the Canadian medical system does not track statistics on primary brain tumours. Complete and accurate data is needed to facilitate the research that will lead to a better understanding of this disease and improved diagnosis and treatment. October 8, 2010 in brain tumour foundation of canada, brain tumour information days, brain tumours, canada, hope, information, life, love, showing support, vancouver. The Brain Tumour Foundation is hosting an Education Day here in Vancouver on September 18! 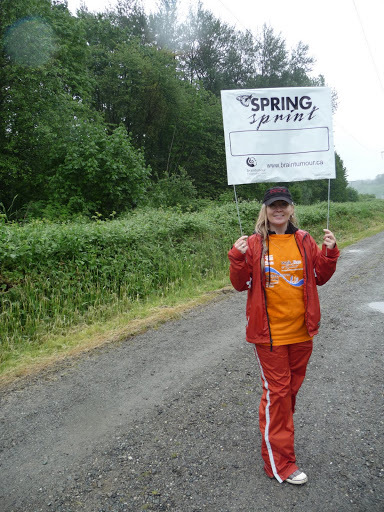 Can’t wait for the 2011 Spring Sprint! Yayy!! ← Meditation is like training a dog. Your breath is the treat.